Every now and then, a game comes along that no one really expects much from; usually from a lesser known developer, and publisher, and sort of flies under the radar. 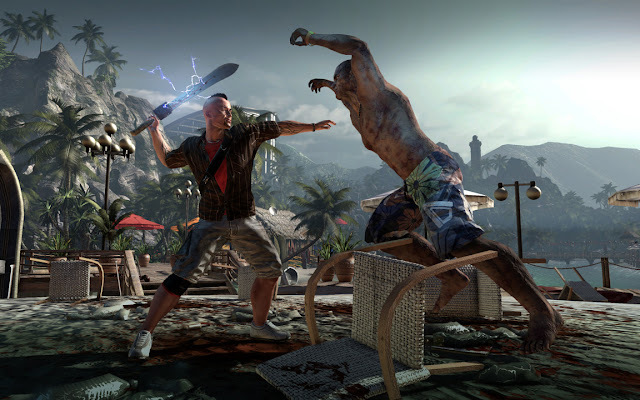 Please direct your attention to Dead Island, a little gem from developer Techland, and published by Deep Silver, just released last week. You'll actually have a hard time finding a copy, as they're flying off shelves at all retailers, but if you find one, snap it up; for with it, you'll find one hell of a ride. I played Dead Island at E3 back in June, in a private room with some of the games developers. At the time, I thought, it had some potential, but I was left with a pretty non-descript taste in my mouth. Was this because we were dropped into the story unbeknownst of the actual time line with no context? Or was it the hub-bub of our crazy schedule, and the buzz of the showroom floor (and other titles) that kept me from really enjoying it? I'll never know...perhaps it was just another 3-4 months of polish the team put in, cause now, I CAN'T STOP playing this game. Okay - let me back up a little bit. Lets talk about the game itself. 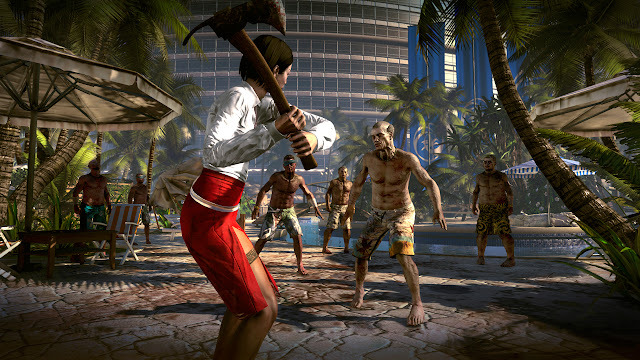 Dead Island drops you on a picturesque tropical island (duh), just before a Zombie outbreak overrules it all. Wait, zombies...how original...but truly the developers have found a way to make this work. This is Borderlands meets Dead Rising meets Left 4 Dead. This is Dead 4 Borderland Rising - that's it's new name. You begin the game choosing one of 4 obligatory character types to lead through the carnage. There's the tank, the long-range weapon user, the melee and the "all-around" character. It's geared for coop action, and you can drop-in and drop out with your friends, or others on Xbox Live (or PS3 if that's your flavor). I however, was playing all by my lonesome. 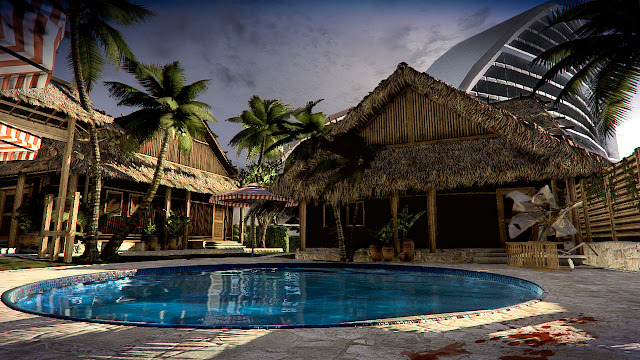 Gameplay consists of exploring the island, finding weapons along the way to protect yourself from the zombies. Your first set will be boat oars, wooden planks, bats, etc but as you progress you'll access much more sophisticated weapons. I picked up this radical sickle, that slices zombie heads off like a plastic knife through jello. You'll also find lots of items laying around. In the beginning, you just pick up everything right, amassing an inventory that you never really know what you'll do with it until you start getting into weapon modification, so it's best to just collect! You soon meet other survivors, though for some reason, you're the only one who's "immune" to the zombie infestation (aren't you glad you got your Zombie immunization shot early this year?). As you talk to various NPC's you'll get missions that start off simple enough (make it to the Lifeguard tower, rid of zombies and the survivors will follow), you'll soon establish of base of operations and your quest log will fill up with tasks ranging from the mundane, to the insane. Its at this base, you can repair, upgrade and modify weapons, "fast travel" to other bases that you'll discover, and pick up vehicles to drive. Now speaking of driving, after you complete a few missions, you'll get access to enter some cars/trucks and drive them. This makes for some quick coverage of ground, and some delightful sights and sounds of running over a swarm of zombies on the side of the road. Driving mechanics are a bit slow, and the I wished for a third-person view of the vehicle, I quickly was able to get used to it. Mission structure is delivered through conversations with NPC's and then logged. You can quickly view all active missions and pick/choose which one to target based on difficulty and proximity to your current location. Also within the interface, you can view/manage your inventory, view the map, equip/swap weapons, and manage your skills. As you level-up, you are given a skill point to assign to various areas of focus. Very similar to Borderlands skill-tree. Also, aside from your standard Achievement/Trophy list, there are other challenges that keep track of various activities, like "traverse 20,000km on foot", "explore the entire island", "travel 10,000 in a vehicle", etc. Graphically, the game looks phenomenal. Very colorful, and a rich, detailed world. There is a good variety of light/dark areas, and the shadows and lighting is pretty amazing in certain moments. This is a developer we should be definitely keeping an eye on. 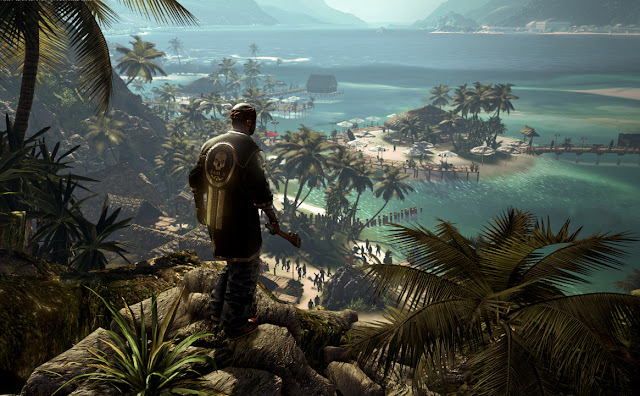 Overall, there's alot to love about Dead Island. A completely new IP destined to see spawn a franchise filled with a ton of content and a full island to explore, I can't wait to unlock all of the island's mysteries. I even hear the troubled Oceanic Airlines had a downed plane in the jungles - I'm searching for the Others. 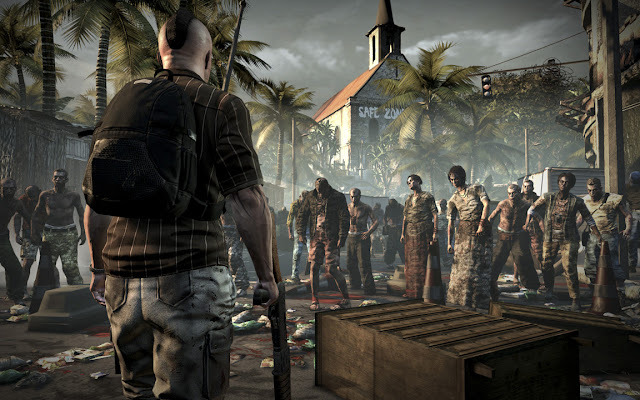 Mashbuttons.com gives Dead Island a 9 out of 10 and is available now for PlayStation 3 and Xbox 360 .